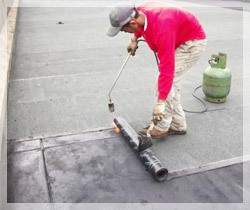 Bituminous waterproofing methods are designed to protect commercial and residential buildings, bituminous roofing is suitable for all kinds of buildings. Bitumen is a mixture made up of organic liquids having highly sticky, viscous, and waterproof properties, this is the specialty of Bitumen. These properties are suitable for a roofing material. So Bitumen can be used to construct roofing sheets of higher quality. APP Bitumen Membrane sheets are rich in bitumen. They have high water resistant and heat resistant properties. And also it have an excellent expansion property and it shows high stability in varying temperatures.APP Bitumen Membrane sheets are convenient for all types of building. 1. Basement and roofing of key waterproof engineering, general and civil engineering. 2. Bridge, road, granary, tunnel, park, swimming pool, sewage purifying pool and others. 3. Especially adapting to the area with strong sunshine or high temperature. APP Bitumen sheets have high anti-aging property and it have anti-alkaline property too. It is resistant to high temperature and water. It have high tensile strength so it shows high elongation capacity, which adapts to the contraction or crack of the base. APP Bitumen sheets are dry, strong, smooth, brittle, tensile and it have beautiful clean base too. It can survive in any atmospheric conditions, since it have higher resistance towards water and heat, that is the main advantage of APP Bitumen sheets. Installation: Installation of APP Bitumen sheets should do very carefully. Heating to melt, place the membrane correctly and steadily with care, fire torch, evenly heat the waterproof membrane and foundation, when the surface of the waterproofing membrane is black and bright with a fusion layer, then apply the membrane and press it into a solid and makes it flat. Bore the waterproof membrane and seal the edge of joint by float.